The ultimate Food Additives and Cosmetic Ingredients guide at your fingertips. Feature rich and full of essential information. 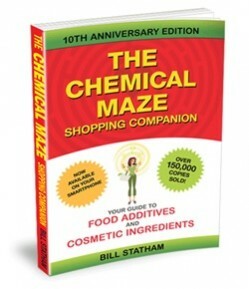 THE CHEMICAL MAZE SHOPPING COMPANION 10th Anniversary edition (Your Guide to Food Additives and Cosmetic Ingredients) continues to be the book of choice when it comes to providing consumers with easily understood information on the potential health effects of food additives and ingredients in cosmetics and personal care products. This latest edition is fully revised and updated with over 400 new entries. Here is an invaluable companion on your shopping trips to the supermarket. Learn to recognise consumer friendly foods and personal care products so you can protect your health and the health of your family. Complete and extensive content coverage. Detailed INS and E numbers, additive information covering, functions (for example thickeners, stablisers etc), potential effects (allergic etc) and possible uses (used in food for jelly, infant foods etc). . It is not until you come face to face to illness caused by food additives in everything do you appreciate a handy tool such as the Chemical Maze.